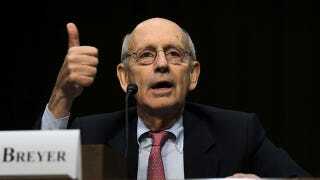 He thought he was on vacation from all the usual battling that goes on in the Supreme Court, but little did Justice Stephen Breyer know, he was in for a much bigger fight. He and his wife, along with two other guests, were in their vacation home on the Caribbean island of Nevis last week when an intruder came in with a machete. The man ended up stealing $1,000 in cash before fleeing the scene. No one has been arrested, and it's not yet clear whether the robber knew who Breyer was. Supreme Court Justices are offered protection by the U.S. Marshals Service when they travel, but there is no comment on whether there was a marshal anywhere nearby when this happened. Thank goodness nobody was hurt, and that dumb bandit better hope he never gets caught because you can bet the full force of the law is going to be smacked down upon him.